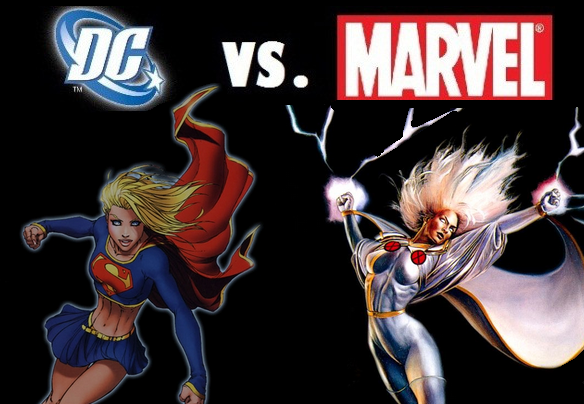 For as long as there have been comic books, there has been the feud between DC and Marvel. Both are heavy-hitting comic companies that continue to gain legions of fans every year. The purpose of this column is to take one DC persona and one Marvel persona of equal measure and popularity and pit them against each other to see who would come out on top and who is a better character overall. Kara Zor-El is Superman’s cousin from Krypton who made it to Earth after he did. Kara’s history is filled with supervillains: Brainiac destroyed her planet, Darkseid brainwashed her into attacking Superman, and Lex Luthor used black kryptonite to split Kara into two entities (one good and one evil). Teenage Kara developed ties with the Kent family and after a failed attempt at attending high school, Kara met The Outsiders and became friendly with many superheroes her own age, including Stephanie Brown and the Teen Titans. Supergirl, who has been around since 1958, has a long and complicated history that has kept readers attached to her character throughout the generations. 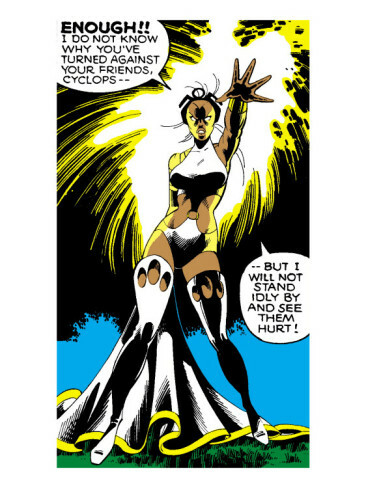 Ororo Monroe first showed up in Marvel comics in 1975. She is part of an ancient line of African priestesses who can wield magic. After a plane crash killed her parents young Ororo was taken in by Achmed el-Gibrar and trained to be a master thief. She soon discovered her ability to control the weather and an elderly woman from her ancestors’ homeland taught her how to control her powers. Since being recruited to the X-Men by Professor X, Storm has been a part of many famous and complex storylines. She even led the team for a while after challenging Cyclops for the role. Storm’s storylines have been grounded in reality and fantasy and have provided readers with original and endearing stories. 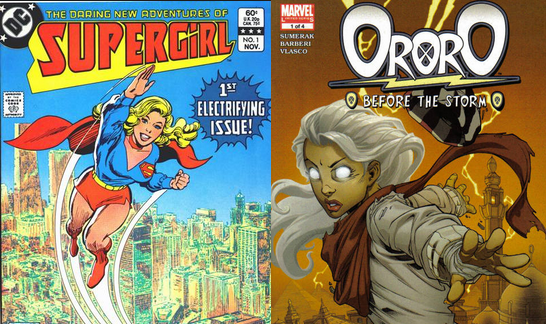 Both Kara and Ororo have rich backstories that establish them as individuals while interweaving them with other characters but Kara has had more time to develop her own storylines in individual comic runs. Supergirl shares her abilities with her cousin Superman. Earth’s yellow sun gives her super strength, speed and stamina, heat vision, super-hearing, enhanced vision (including ex-ray and telescopic), flight, invulnerability, and super-breath. Also like her cousin, Kara is vulnerable to kryptonite and magic. Kara is also known to be advanced in hand-to-hand combat, languages, intellect, and artistry. Storm’s most famous ability is to manipulate the weather which she does by “sculpting” the environment around her. This ability makes her extremely powerful. She can also fly, resist telepathy and weather events, and express ecological empathy as well as energy perception. As mentioned before, Ororo is also an expert thief as well as combatant and even an expert gardener. 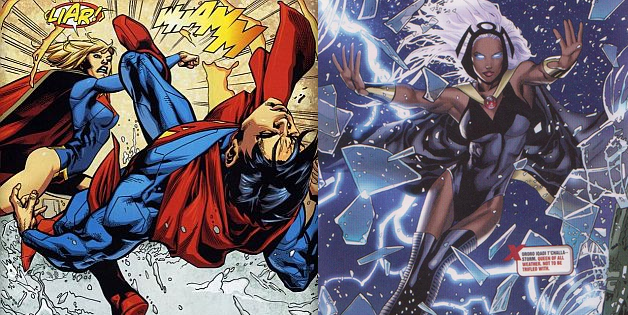 Both ladies rank as top tier when it comes to powerful superheroes but Storm’s powers are not only incredibly strong but also incredibly unique, unlike Supergirl, who is pretty much a carbon copy of Superman. As soon as she arrives on Earth Kara is taken under the wings of Superman and Wonder Woman. Supergirl has at one point been a member of many different groups including the Justice League of America, Supermen of America, Justice League of Amazon, Kryptonian Science Guild, Teen Titans, Legion of Super-heroes, and Female Furies. Storm is famous for being a member of the X-Men and stayed a member of the team for many years. After Cyclops’s departure, Storm became a strong a capable leader of the X-Men, later winning back leadership after being challenged by Cyclops. The two eventually became co-leaders when the team splits. Storm later joined The Avengers as well and at one point is forced to choose between the two. Both ladies have formidable alliances but it is Storm’s loyalty and leadership with the X-Men that give her this category. Supergirl is known for having a costume that frequently changes. It usually mirrors Superman’s in some way: blue, red, and yellow with the family crest on the chest. The costume also usually has boots and a cape. While her costume may frequently change, readers can always recognize Kara as Supergirl. Storm’s power comes from inside but she often carries lock picks as well as a large knife and staff for protection. She can also drive the X-Men Blackbird. Storm has also had many costume changes over the years, including various X-Men uniforms. Her most interesting phase is probably when she sported a badass mohawk and leather ensemble. Neither ladies rely on weapons and both have had an impressive array of uniforms over the their runs but Storm’s extra trinkets as well as more interesting and unique looks gives her the edge in this category. Supergirl is one of the most popular female DC characters, often appearing alongside Batgirl and Wonder Woman on merchandise. Following the successful Superman film series with Christopher Reeve, Helen Slater stared in 1984’s Supergirl which ultimately got terrible reviews and little revenue. Supergirl appeared in live-action form again in the seventh season of Smallville (played by Laura Vandervoort). Supergirl has had much more success in the animated medium with appearances in Superman: The Animated Series, Justice League Unlimited, Superman: Unbound and Superman/Batman: Apocolypse. Supergirl ranked 94th on IGN’s list of the Top 100 Comic Book Heroes of All Time. Storm is one of the most easily recognizable and beloved X-Men characters. She is known for not only being a strong female character in the Marvel universe, but a fabulous representation of strong women of color as well. She is portrayed by Halle Berry in three different live-action films (X-Men, X2: X-Men United, and X-Men: The Last Stand) and will be in the upcoming X-Men: Days of Future Past. Storm was ranked as the 89th Greatest Comic Book Hero of All Time by Wizard magazine and as 42nd Greatest Comic Book Hero of All Time by IGN. She was also Storm was ranked 30th in Comics Buyer’s Guide’s “100 Sexiest Women in Comics” list. At the end of the day, Supergirl has a richer backstory and is just enough more marketable and recognizable to win this category. Supergirl and Storm are two titans of the comic world. Both are extremely popular and even more powerful. Despite Supergirl’s epic history and worldwirde fame, Storm comes out on top for being just as badass but much more unique . Category : Obligatory Comics Section, Showdown! I can get behind most of what you said here. Storm is certainly awesome and a far more complex and unique super. I would like to point out, Supergirl may not be the most popular female character in DC. I would assume that honor would go to Wonder Woman? Normally would not question the knowledge of anyone in Funk’s House of Geekery, maybe it’s just me even though I tend to like underdog heroes (with the exception of my love of Superman) especially on the female side. I actually said “one of the most popular” but really no one can make a definitive statement either way since there’s no way to prove popularity.